Following the 2007–2009 recession, the number of persons who were out of work for an extended time rose to record high levels. The Bureau of Labor Statistics has created measures of the number of weeks the unemployed took to find work or quit looking and leave the labor force. These data show that the median length of time an unemployed person searched before finding a job increased sharply between 2007 and 2010, from 5.2 to 10.4 weeks; in 2011, it edged down to 10.0 weeks. 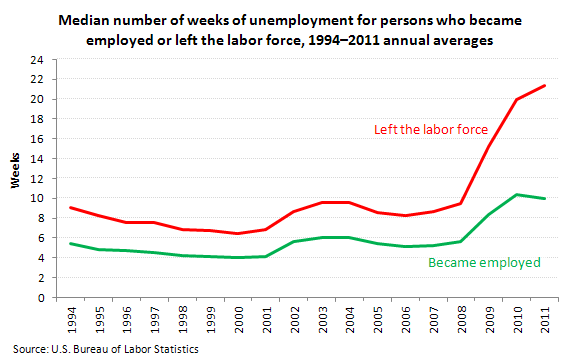 Unemployed individuals looked much longer for work in 2011, compared with 2007, before giving up and leaving the labor force, 21.4 weeks versus 8.7 weeks, respectively. From 1994 through 2008, roughly half of successful jobseekers found work within 5 weeks of beginning their search. Prior to the start of the recent recession in December 2007, for example, 49 percent of those who were unemployed in one month but employed in a subsequent month had been jobless for fewer than 5 weeks. In 2011, a little more than one-third of jobseekers found work in fewer than 5 weeks. As the share of short-term successful job searches declined, the share of long-term successful job searches (those lasting 6 months or longer) increased dramatically. By 2011, more than a quarter (26.7 percent) of successful job searches lasted 6 months or longer, with about half of those taking more than a year. In comparison, about 10 percent of successful job searches lasted 6 months or longer in 2007. Jobseeking women spent less time than men searching for work in 2011 before succeeding (medians of 9.6 weeks versus 10.2 weeks, respectively). Unemployed men, however, were somewhat more likely than women to be successful in job searches that lasted 27 weeks or more (27.3 percent versus 25.7 percent, respectively). These data are from the Current Population Survey. To learn more, see "Job search of the unemployed by duration of unemployment," (HTML) (PDF) by Randy E. Ilg and Eleni Theodossiou, Monthly Labor Review, March 2012. Bureau of Labor Statistics, U.S. Department of Labor, The Economics Daily, Length of job search for the unemployed on the Internet at https://www.bls.gov/opub/ted/2012/ted_20120424.htm (visited April 23, 2019).